Nestled among farming fields, just 20 minutes from the city of Denizli, lies the sleepy village of Pamukkale – home of the ruins of the ancient Roman spa town of Hierapolis (“holy” or “sacred” city in Greek), built by Eumenes II (the King of Pergamon) in 190 BC and the famous white travertines (thermal pools). 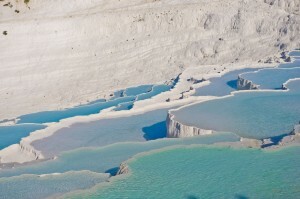 As water from the hot springs that run below Hierapolis flowed down the steep hill below the ancient city it lost carbon dioxide, and deposited stepped layers of white limestone. 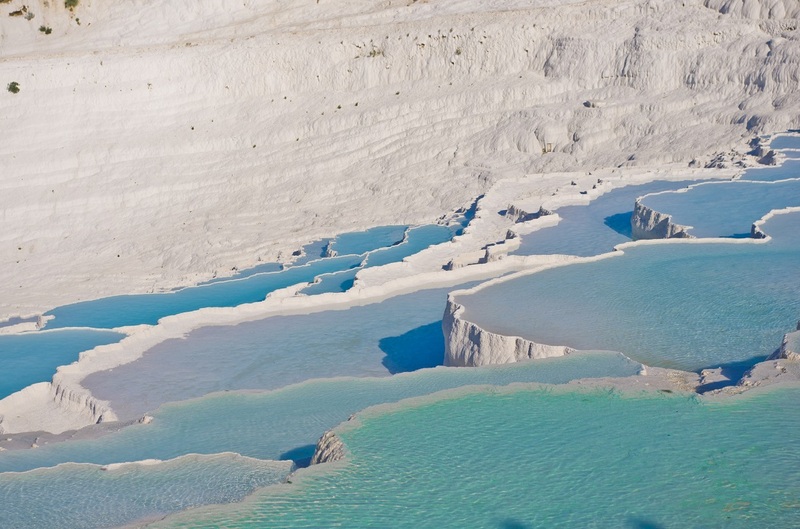 It is the formation of these which gave the town its modern name of Pamukkale, which translates in Turkish to “cotton castle”. Hierapolis was primarily a resort and healing centre, although it was also famous for its textiles – a tradition that continues today. In ancient times, people came from all over to bathe in the waters which were believed to heal skin conditions, arthritis and more. After earthquakes destroyed the city, buildings were rebuilt in the Roman style, as the city was under control of the Roman Empire at that time. Under Roman control, it became a popular centre of arts, philosophy and trade. The ruins of Hierapolis are extensive – visitors will see city walls, an impressive theatre, a temple of Apollo, baths, paved streets and an incredibly well-preserved necropolis (burial ground). Visitors to the site also have the chance to swim over fallen Roman columns in the Cleopatra Antique Pool (for an additional fee) which is fed by the thermal springs, making the water lovely to swim in at any time of year.